“Do you want to come down now?” a voice asks from below. A little girl about four years old clings to the side of a 48-foot-high boulder. Her hands are gripping the tiny rock protrusions overhead, her feet braced on rock formations below. In her pint-sized climbing shoes, tiny red shorts, and a miniature climbing harness she is the youngest climber I’ve seen today. Her tiny face peeks out from an oversized yellow helmet as she tries to decide whether or not to keep going. The flash of my camera catches her eye and she glances over. I feel I’ve made her self-conscious, so I put away my camera and move on. I’m visiting the REI store in Denver, Colorado, a store that sells outdoor recreation gear, sporting goods, and clothing. I’m not in the market for any outdoor gear, just stopping by to see the store, the building, and its epic climbing wall. The Denver store is housed in a building originally built in 1901 for a trolley car factory. The restored, multi-level, 90,000 square foot building has an all-brick interior and exterior, large round top windows, and exposed steel beams. Daylight pours in from the many large windows and skylights. Wood used for the stairways and floors was salvaged from a mine in Montana, giving it a warm feel. The main floor is multi-story and open, with second story alcoves around the perimeter accessible by stairs or elevator. Log furniture sits near a tall fireplace, and provides a place to sit while reading the travel books displayed nearby. The historic building is listed on the National Register of Historic Places. In the center of the store sits a three-story-high climbing wall created to simulate the natural climbing environment as much as possible. Its imposing structure, illuminated by skylights and spanning several floors, can be seen from all over the store. Shoppers often stop by to watch climbers, looking up and snapping photos from their cell phones. Devoid of the usual brightly-colored handholds of a traditional climbing wall, this structure looks exactly like the red rocks found on the mountains outside of town. According to a friendly store employee, the building is rich with history. He explained that local residents often bring their out-of-town guests here, just to see the place. 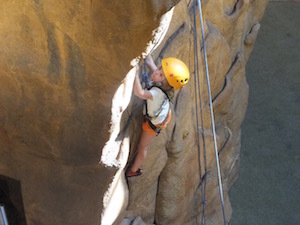 When I walked by the climbing wall/mountain on my way out of the store, the four-year-old girl was long gone. In her place a couple of eager teenage boys were about halfway up, hoping to beat each other to the top and be the one to ring the bell. On the floor a middle-aged dad was suiting up for his turn. I suspect the guys holding the safety ropes were in for a busy day. 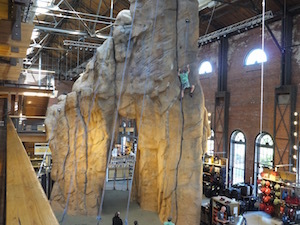 For a tourist attraction that’s not really one, REI Denver is definitely worth the visit. There’s even a Starbucks!